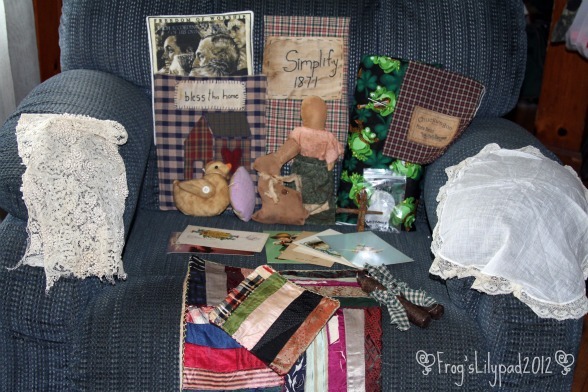 I’m sharing a few of my primitive decor items I’ve made and sold. Last month, I joined a prim swap. I was so excited about doing a swap, since it has been several years since I joined in on one. This was my first prim swap, so it was REALLY exciting! Yesterday, my package came in the mail. We stopped at the mailbox when we pulled into the driveway and I watched Jamie as he went and pulled out all the mail. Yep, I forgot to go on Thursday until it was dark and since we have coyotes and foxes on the prowl, I just left the mail.The first thing he pulled out was a large envelope and I got all excited. When we came in the house, Jamie and I sat at the table oohed and awed over everything and enjoyed some very yummy fudge that was included in the package. It was like Christmas! This is what my friend Nancy sent. I took a picture of all the things that I sent to her, once she receives her package, I'll post a picture. Nancy has been working on a Celebrity's Favorite Recipe Cookbook. You can see more about it on her selling BLOG. I hope you all have had a good week and having a good weekend. 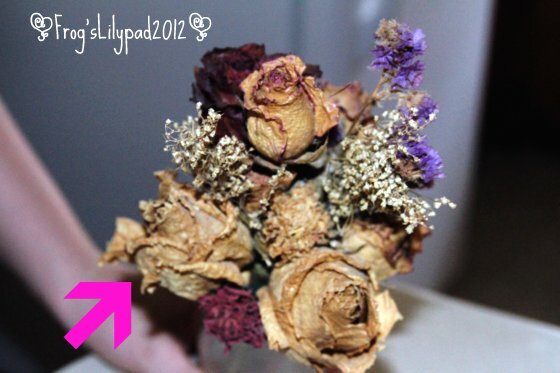 I love the dried flowers! Not the brown, crunchy kind that have not been taken care of, but the flowers that still have color. When I walk through the flowers at Hobby Lobby and Michaels, I always end up in the dried flower section. I love them! I just don't like the prices on them. 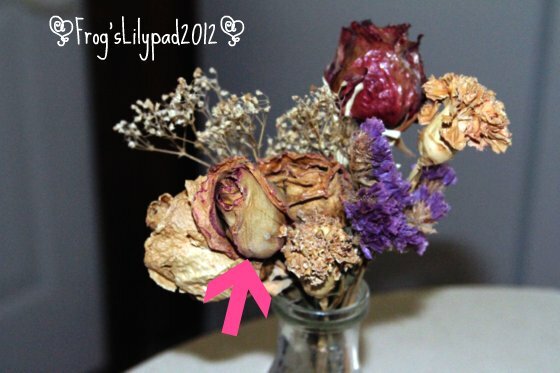 Several years ago, I was watching a DIY show and the lady was talking about drying flowers and how to keep them from looking "unloved". The one thing that she stressed was that drying flowers was easy without using chemicals; you really don't need it for most flowers. She took a bouquet of roses and wrapped a rubber band around the stems and then wrapped the other end of the band around a wire clothes hanger. She even clipped a clothes pin to hold the rubber band for added protection. The lady went on to say to hang the hanger where the flowers will be able to hang without touching anything, so they won't end up with a mashed side. 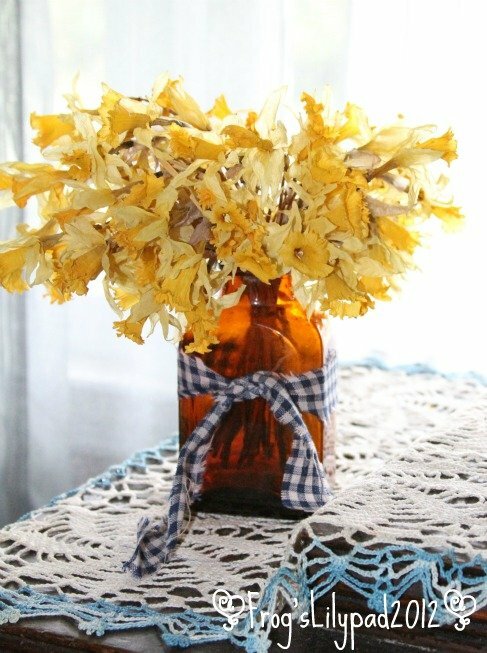 Once the flowers are dried, spray them with a clear acrylic spray. I did this with some of the small flowers that came from my Mother in law's funeral in 2008. The flowers that had color other than white or cream, has kept their color. The first picture with shows a cream and dark pink edged rose. The pink has stayed. The red roses did beautifully. In this photo, you'll see how all the roses stayed closed and perfect in shape except for the one with the arrow. I think I have bumped it several times while dusting, so it has loosened up some. As for dusting? All I do is gently blow on the flowers. 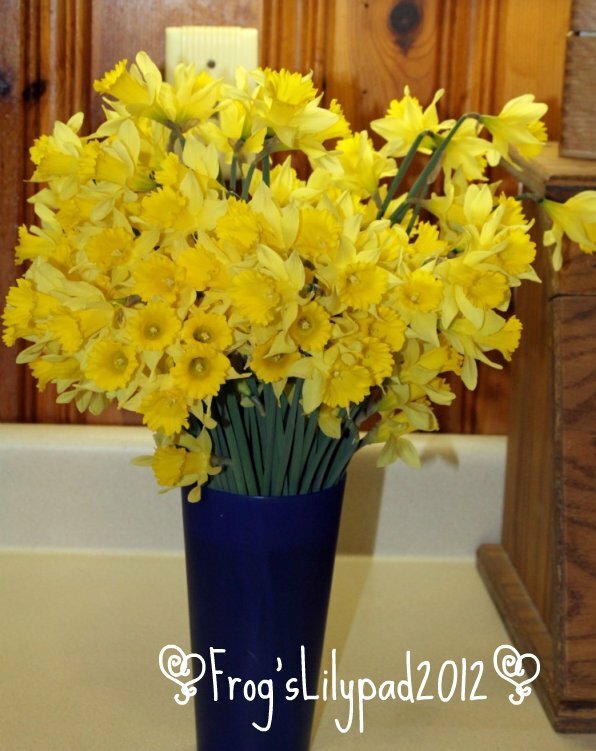 I went to the laundry room on Wednesday and pulled the daffodils down and this is what I found. They are very papery. I did spray them, so hopefully, I'll be able to keep them awhile. The brown bottle I put them in is one of my husband's treasures he found while digging around in the woods. The only thing about the daffodils is their heads tend to turn up when they are hanging. So I ran out to the field and picked a few more and hopefully came up with a solution. DO NOT LAUGH! I knew I wanted to try and keep the heads up when they are dried. So I took a piece of twine and tied around the stems right under the flower. Then I put the flowers in a tissue paper tube and put them in just a smidgen of water, since I'm not wanting to keep these out for long. Tonight I'll take the flowers and the tube and hang them upside down. 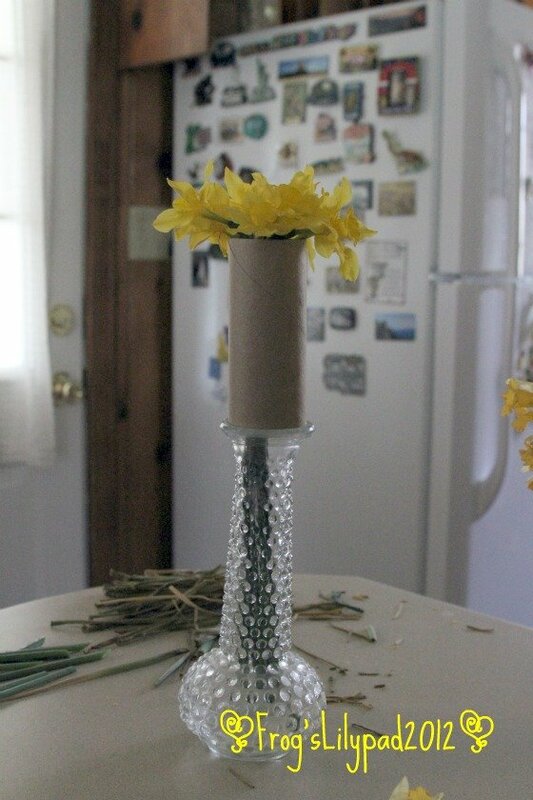 Hopefully, the weight of the tube will help hold the flowers down while drying. This was an experiment on drying daffodils. I am not an expert on flower drying.